Restylane® is one of the treatments offered at Infinite Med Spas. Restylane, like Perlane®, is an injection that is made with hyaluronic acid, which is naturally occurring within the body. The gel boosts facial volume and smooths wrinkles. The difference between the two injections is the particle size. 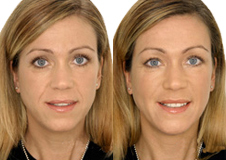 Restylane is better suited for patients with thin skin or fine lines. Restylane is effective in treating smile lines, thin lips, nasolabial folds, forehead wrinkles, and other wrinkles around the nose and mouth. The Restylane treatment will take no more than an hour of your time and you will typically be able to continue with your daily activities right after treatment. It is not uncommon for patients to experience swelling or redness, which should only last a few days. Results from a Restylane treatment will be visible within about a week after treatment, and will last from six to twelve months after treatment. It is recommended that the patient return after this time in order to sustain the results of the Restylane treatment.